"A License To . 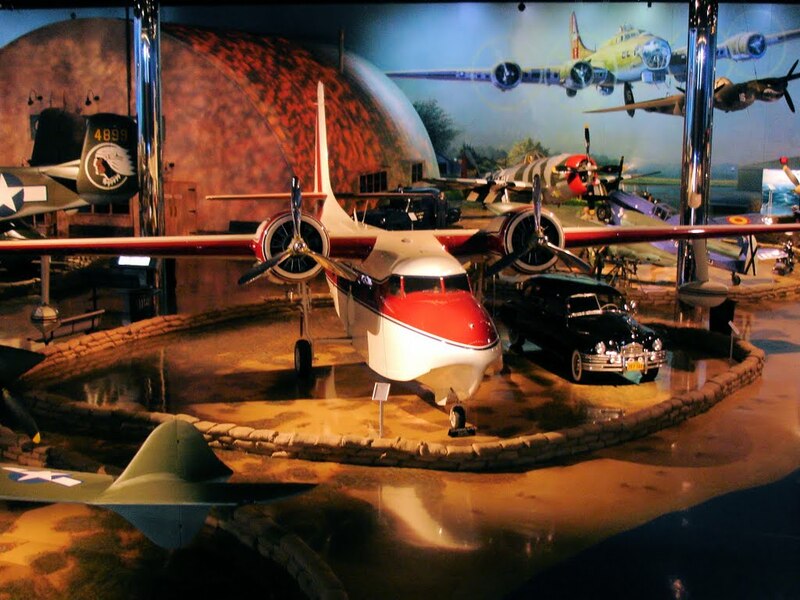 . ."
With a stroke of his pen in 2002, Designated Pilot Examiner Clifford Walter certified me as a private pilot. Handing me a paper certificate bearing his drying signature, he reminded me that it was a license to learn. What he did not tell me was that it was also a license to study icing patterns on the Great Lakes, a license to discover historical treasures, and a license to manage out of state family drama. These disparate things were certainly not on my mind the day I passed my check ride in Elkhart, Indiana. 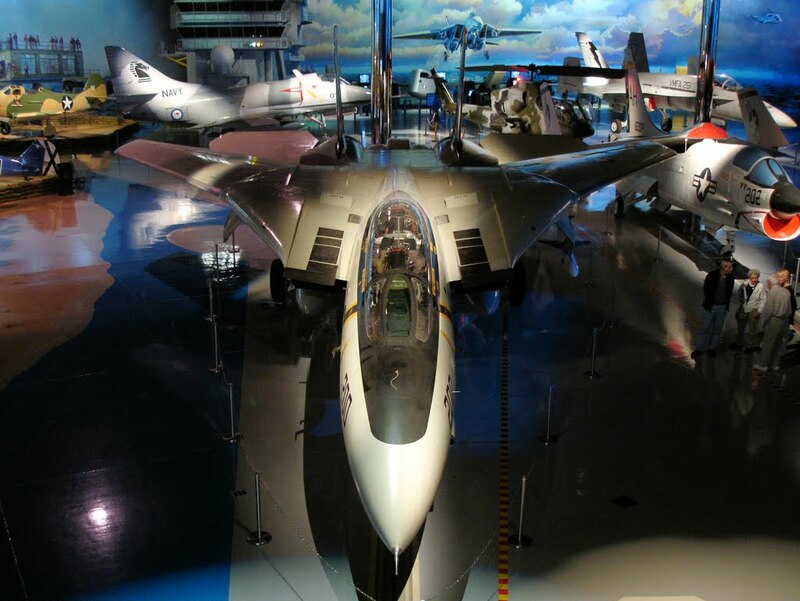 They were nonetheless at the fore of my thoughts as Warrior 481 and I flew back to the southeast quadrant of the Mitten on a sunny winter morning. I introduced my grandparents and my turbulent relationship with them in a previous tale. Since then, my grandfather's health has declined further. The impetus for this trip was news that he had been admitted into hospice. I was stunned by this news, but oddly enough, the tone of it did not carry the urgency one might expect when "hospice" is involved. The unfortunate truth is that all news on this front reaches my ear via my Dad in Tennessee. It arrives muddled and piecemeal, a product of poor information and lack of detail supplied to him by my grandmother in Michigan. For those of us not in Michigan, questions swirl around whether she is acting in my grandfather's best interests. This is a concern because his difficulty speaking inhibits his ability to advocate for himself effectively. I decided that I was not only due for a visit, but that I needed to get firsthand understanding of the situation for myself and for Dad as the family drama escalated. Miraculously, the capricious weather broke long enough to make the trip quickly and safely by air. The winter air mass that settled over Rochester, NY in February 2015 set records for sustained low temperatures. Lake Ontario, which is generally resistant to freezing owing to its ratio of depth to surface area, reached 70% ice coverage the day I flew to Alton Bay. Sodus Pier, March 9, 2015. Earlier in the week, I did a short post-maintenance flight and noted that lake ice around Sodus Pier was still mostly solid and extended as far as the eye could see to the north and east. But to the west, the lake surface practically glowed with the shocking blue of open water. A local meteorologist pointed out that the ice accumulation at the eastern end of the lake is likely a wind driven phenomenon. Looking north across Lake Ontario. I filed an IFR flight plan to Oakland County International ("Pontiac") via airways: ROC V2 DELOW. Westbound from Sodus, while picking up my clearance in the air from Rochester, I could see the crisp demarcation where the ice cover on Lake Ontario ended. Airway Victor 2 took me directly over Buffalo and then along the north shore of Lake Erie. After the brilliant blue of open water on Lake Ontario, the view of Lake Erie was striking. It was entirely frozen over save for a small area of open water off the Buffalo waterfront at the headwaters of the Niagara River. A impressive edifice below caught my eye. It was roughly two to three miles east of downtown Buffalo and obviously a train station. Web searching revealed it to be the Buffalo Central Terminal, a grand Art Deco masterpiece raised in 1929. It operated until 1979 and is now the subject of a massive restoration effort. I found myself fascinated by the tale of this abandoned architectural wonder. How many such interesting discoveries have I made from the air since I earned my certificate? Briefly, a lot. In past journeys to southeastern Michigan, our route always took us north or south of Buffalo. Today's passage afforded opportunity to really study the city as we passed directly above it. My attention was drawn to the imposing Art Deco City Hall that dominates the skyline (frame right). In a square east of City Hall stands an obelisk in tribute to President William McKinley, assassinated at the Pan-American Exposition in Buffalo in 1901 (curse you, Stephen Sondheim, for causing me to sing that last morbid bit). I flew most of the length of Lake Erie. Though the surface morphology changed along this distance, I observed no open water except for the portion nearest the Niagara River (above). The river itself was mostly free of ice as Lake Erie drained northward to tumble over the Niagara Escarpment. Several freighters were trapped in ice choking the Welland Canal, the man-made waterway connecting Lakes Erie and Ontario. Once past Buffalo, we cruised along Lake Erie as it reached toward Michigan in stark, frozen monotony. Looking west over southern Ontario. It was an anniversary of sorts. 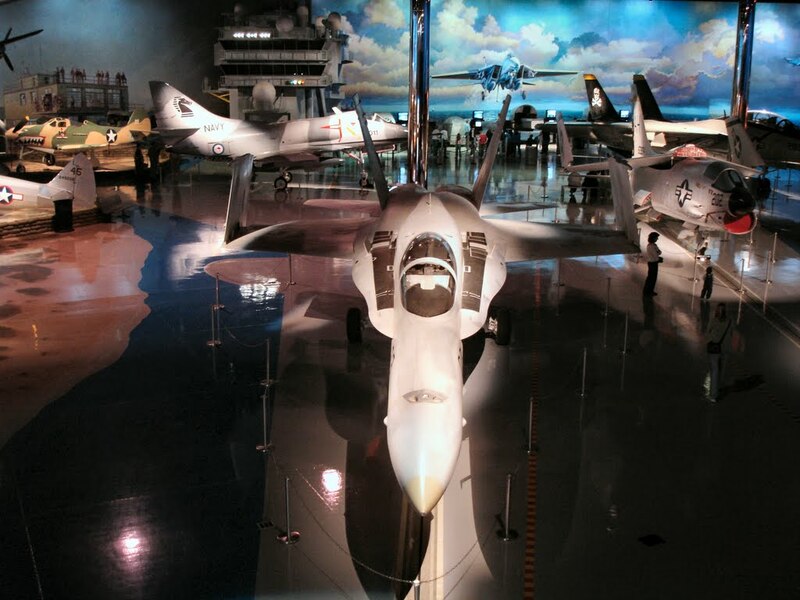 On the same day, eleven years earlier, I flew Warrior 481 home to Michigan from Oklahoma; same plane, same pilot, both changed over the intervening years. As we flew, I reflected on how I had one hour of time in type before that day, compared with the 1210 hours logged in Warrior 481 since. 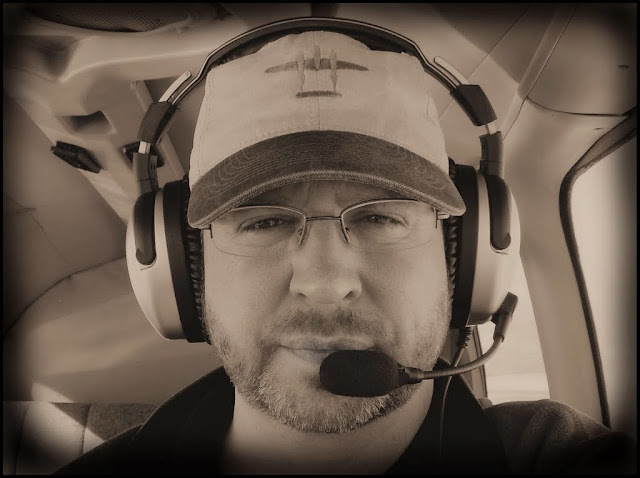 That first cross country flight was flown VFR, avoiding controlled airspace, and without significant interaction with air traffic control; today I was under positive control on an IFR flight plan. I have picked up some gray hairs since buying the Warrior in 2004, but her instrument panel has effectively undergone reverse aging with newer instrumentation installed. Clearly, one of us is aging more gracefully than the other. Yes, same airplane, same pilot and yet, not. Crossing back into United States airspace, I found myself above another frozen expanse: Lake St Clair. Though not as large as the Great Lakes themselves, St Clair is a substantial body of water positioned between Lakes Erie and Huron. Below, a Coast Guard ship (ice breaker?) navigated a narrow passage through the ice from south to north. The channel led from the St Clair River to the north . . .
. . . to the Detroit River to the south. In the distance, the skyline of Detroit came into view as Approach vectored me directly to Pontiac. 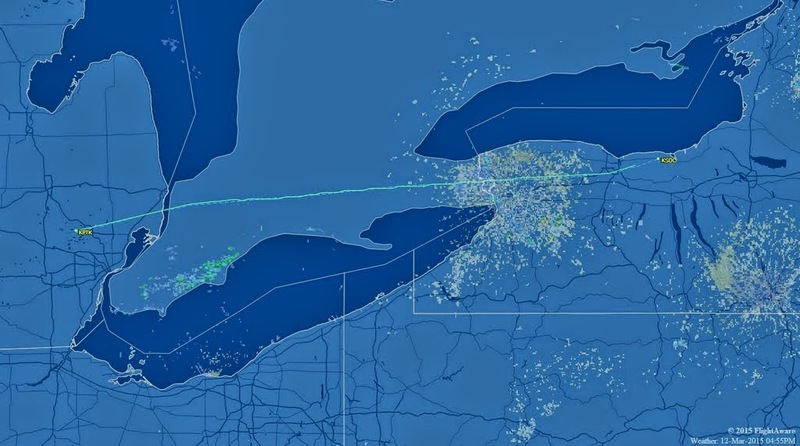 FlightAware track from Sodus to Pontiac. "Warrior 481, turn left taxiway Charlie, hold short Poppa." It may have been the first time I was ever issued hold short instructions for a taxiway. Way to track that center line! In a moment, the reason for this instruction presented itself. It was a Convair twin turboprop cargo ship that my friend Garrett used to fly out of Pontiac. 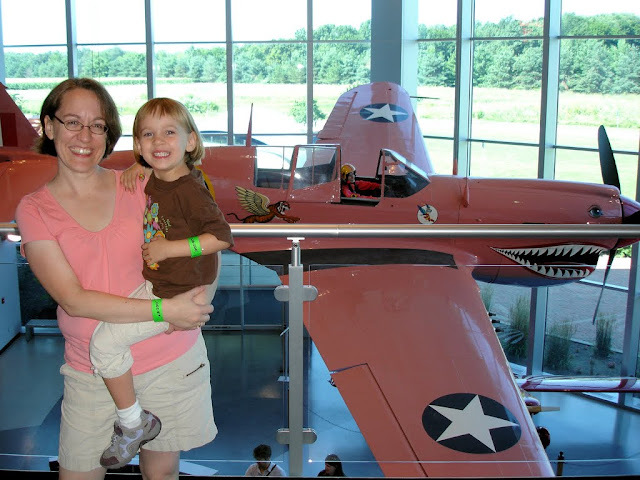 Once it turned off on Poppa, we proceeded to Michigan Aviation where we parked at the end of a spectrum of aircraft; two Citation jets, then a Cirrus SR-22, and finally my Spam Can defining the low rent end of the line. I had called ahead about borrowing a courtesy car and, once on site, verified with a lineman that it was acceptable to keep it for two to three hours. "Of course," he said with a smile. "That's what they're for!" Gratefully, I accepted the keys and drove the late model Dodge Dart first to lunch and then to the nearby nursing home. I found my grandfather on the third floor, sitting in the sun and visibly delighted to see me. He has trouble speaking, but waved-over every passing employee, pointed to me proudly, and clearly enunciated "grandson". The staffers would smile and make the appropriate impressed noises for a few moments before returning to their duties. I spent some time talking to one of the nurses who assured me that he was doing fine and adjusting well to his new surroundings. The facility looked nice, was clean, and the staff were all friendly. When my questions turned to his condition, the nurse cited HIPAA rules and offered to call my grandmother to gain her permission to speak with me. I agreed and, with a phone call, my cover was blown. But I learned a lot of useful - and unambiguous - information about my grandfather's condition that I was able to relay to my Dad later that evening. Most importantly, I learned that the program, though called "hospice", is far from what most consider imminent end-of-life hospice. It is probably better described as enhanced assistance nursing care. Indeed, he appeared to be well cared for and provided with plenty of opportunities for social activities. "Your grandmother told me all about you," said the nurse. "She says you're very important." I sighed and shrugged. "Being important is very important to my grandmother," I offered. The nurse smiled knowingly. She left to attend to other patients and I returned to Grandpa to show him pictures of his great granddaughter. With an electronic chime, the elevator doors opened to admit my grandmother and uncle into the third floor lobby. She peered at me sternly and her first words were, "you sneaked over here." I smiled broadly to deflect this accusation. "Not at all! I filed a flight plan." I explained that I had not made the final decision to fly until early that morning (entirely true, if mildly disingenuous). After a two hour visit, I excused myself to make the journey home. I was happy to have visited with my grandfather and he was clearly happy to have had me visit. Most importantly, my firsthand observations and information gleaned from the nurse will help my Dad as he works through next steps from several states away. "Sneaky" or otherwise, I do not think the trip would have been as successful had I announced my arrival in advance. 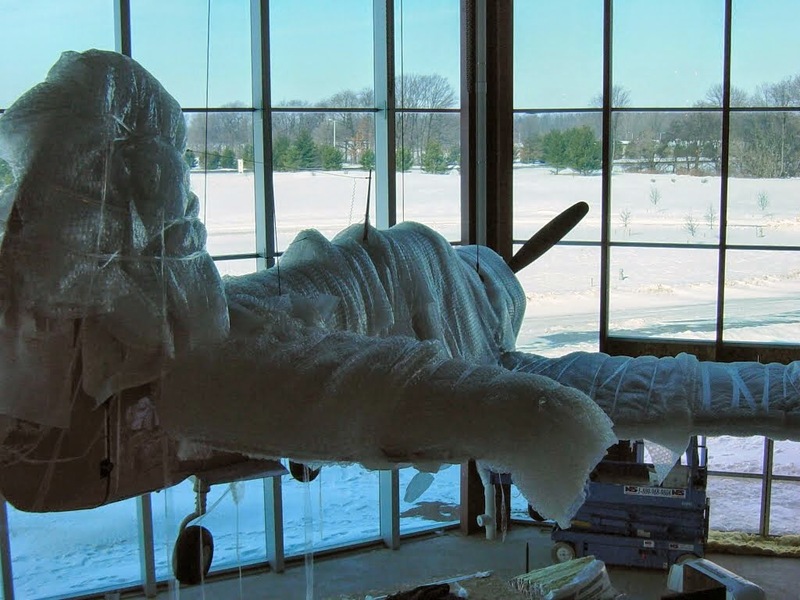 Back at Michigan Aviation, the morning's activity had morphed into a lazy, sunny afternoon. Although there was a steady stream of arrivals and departures on Pontiac's parallel runways, the FBO was quiet, the lobby deserted, and Warrior 481 was the only aircraft remaining on the ramp. I planned the journey home, briefed and filed an IFR flight plan, and quickly received an expected route via Foreflight. By then, I knew the drill: MOONN V90 DKK BUF, a route that would have us fly down the center line of Lake Erie for an extended period of time. I wondered if a successful emergency landing could be conducted on the ice at this time of year. Though an interesting hypothetical to ponder, my flight plan nonetheless contained a "request no flight over Lake Erie" comment. "Warrior 481," transmitted Pontiac Ground Control. "I put in a new clearance for you to avoid flying over the lake. Take a look at a chart and let me know if this works. You are cleared to Sierra Delta Charlie airport via radar vectors to London [Ontario], Buffalo, Rochester, direct." I did not need to consult a chart, this was a perfect overland route nearly approximating a direct course home; kudos to Pontiac Ground! Our cleared route set a more northerly path than the westbound flight that morning and provided a better view of Lake Huron as we crossed the St Clair River. Like Lake Ontario, the ice pack on Huron (at least, the south end of it) was breaking up and the remaining coverage skewed toward the downwind shore. Southern Ontario is not one of those places where one needs to burn a lot of brainpower locating emergency landing sites. Partway across Ontario, before reaching London, Toronto Center amended my clearance to "direct Rochester". With Buffalo eliminated from the clearance, our new course took us directly over Niagara Falls. The view was spectacular! I was astounded by ice accumulated at the base of the American falls that had achieved a height rivaling the falls themselves. For reference, the drop is about 100 feet from the top to the massive rock pile at the bottom. Rochester glowed with the warm tones of evening sunlight. As we passed overhead, I reflected on how the most prominent buildings in Rochester are quite modern compared to the Depression-era Art Deco structures in Buffalo that caught my eye that morning. The remaining voyage home from Niagara Falls to Sodus via the Rochester VOR was smooth sailing. 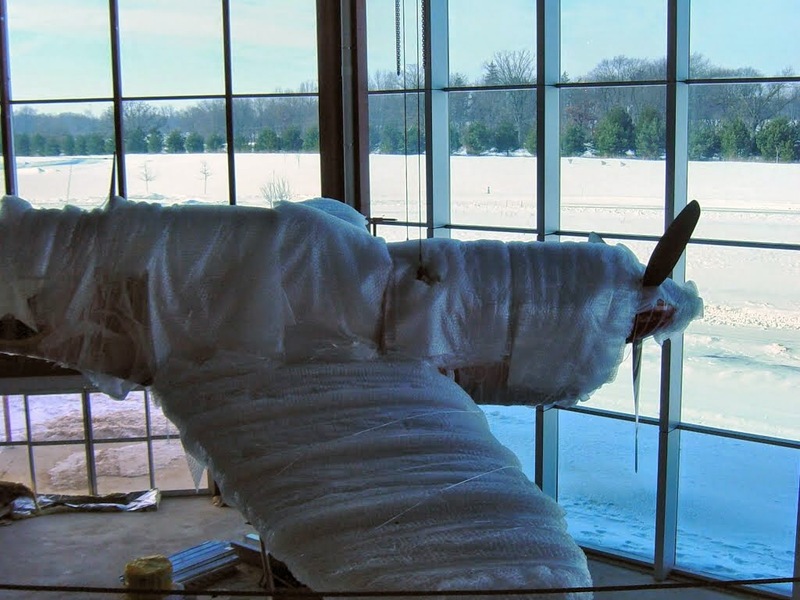 At Sodus, the pattern was busy with Williamson Flying Club members taking advantage of the warmth and sunshine to stretch their wings prior to the monthly member meeting. FlightAware track for the return home - note the oscillations in track across Canada. GPS track from Stratus II - no oscillations! I wonder if the oscillations were a radar artifact? It was a long day. I left the house at 7:00 am, landed in Sodus at 6:00 pm, and returned home at 9:00 pm after the club meeting. Once home, I spent an hour on the phone with my Dad while I cooked and ate my dinner. He was grateful for the information and observations I was able to share; mission accomplished. As always, I genuinely enjoyed flying for the sake of flying. But what truly made the journey worthwhile for me was the exploration of Great Lakes ice coverage, the discovery of interesting artifacts below, and - most importantly - the ability to rapidly clarify family drama occurring three states (or one province) away. All of these things represent joys and benefits of aviation that never occurred to me when I decided to pursue certification in the first place. While sorting through some older photographs, I came across something that one does not see every day. 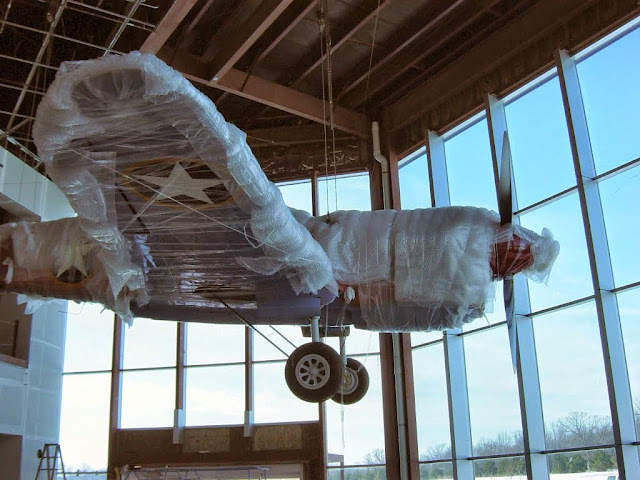 It was a P-40 in Flying Tiger-inspired livery, cocooned in bubble wrap, and hung from the ceiling like a child's mobile. 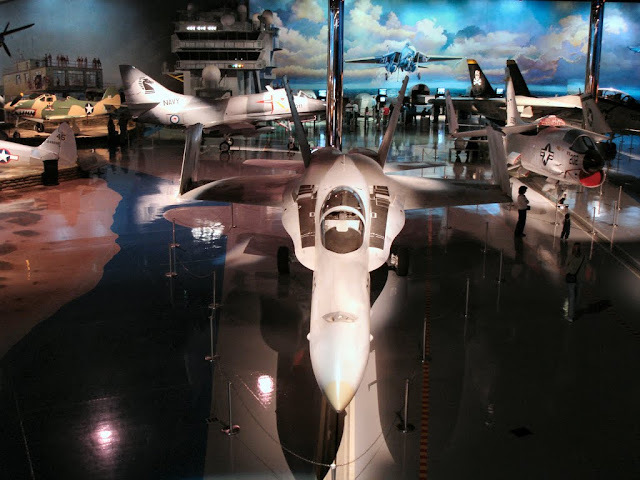 I took these photos eleven winters ago while I was a docent at the Air Zoo in Kalamazoo, MI. We were visiting the building currently known as "Main Campus" to see how construction was coming along. 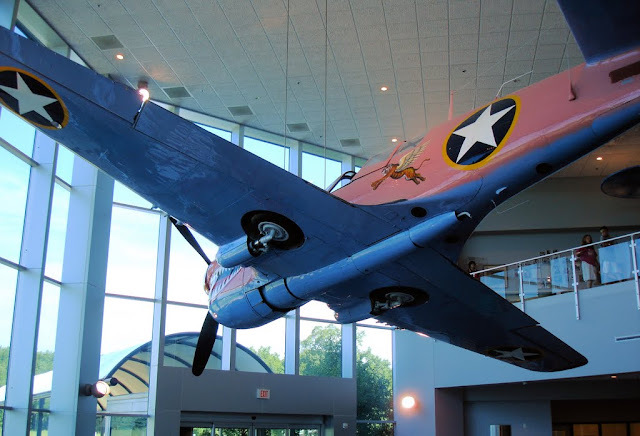 The entrance atrium to the museum was essentially built around this P-40, once owned by museum co-founder Sue Parish. Remove the bubble wrap, retract the gear, and position the aircraft at a rakish angle; this is how it looks today. 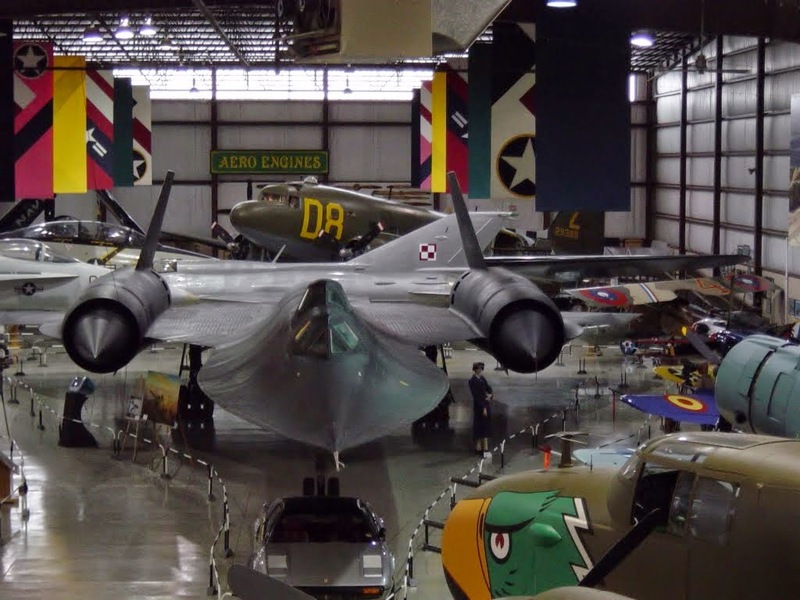 After acquiring the SR-71B Blackbird (the only remaining B variant in the world), the museum's original quarters (now called "East Campus" and serving as the restoration center) had become a bit tight. 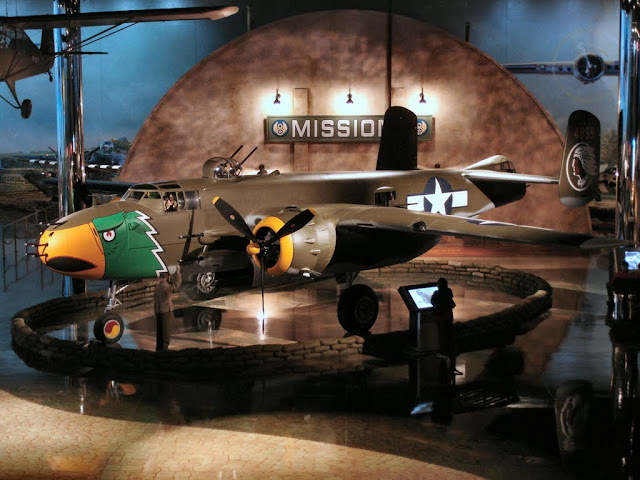 With that said, my compliments to Bob Ellis; the man had a knack for arranging airplanes and this particular arrangement was especially impressive (in this photo alone: SR-71B, B-25, Douglas SBD, Bf-109, SPAD S.VII, MiG-21, Douglas C-47, F-14 Tomcat, F-18 Hornet, and a Douglas Skyraider). In the current facility, the Blackbird has much more breathing room, allowing guests to step back and truly take it all in. 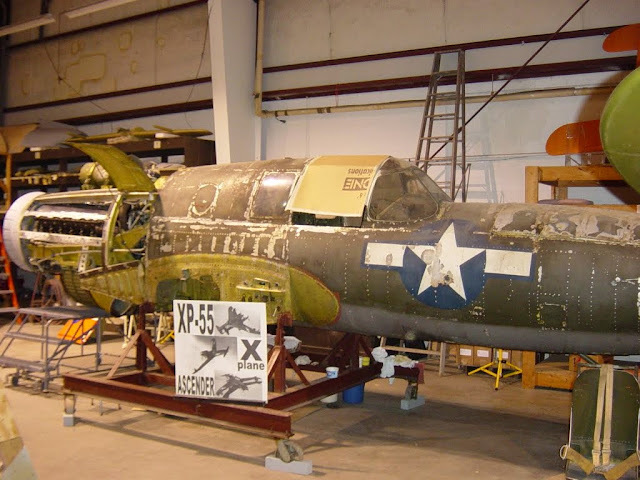 This is the world's only surviving Curtiss XP-55 Ascender as it was displayed in the old Air Zoo restoration hangar (now closed) in more or less the same condition it was received from the Smithsonian. 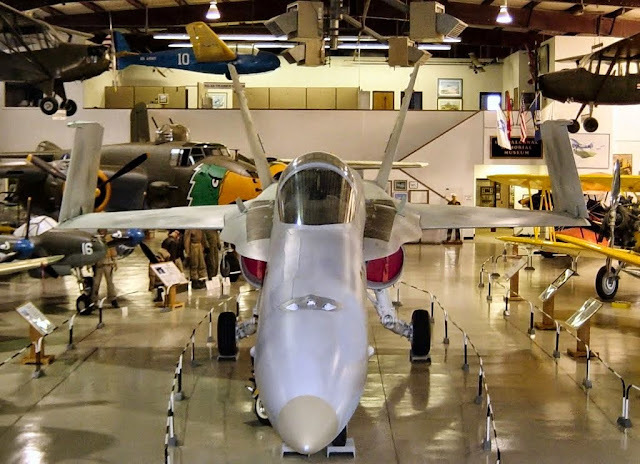 The Ascender cleaned up very well in the hands of the Air Zoo's capable restoration shop. When we visited the unfinished Main Campus building, Rick Herter was still finishing his massive, hand painted (and world-record setting) mural "Century of Flight". The landing Tomcat provided a backdrop to a simulated carrier deck. 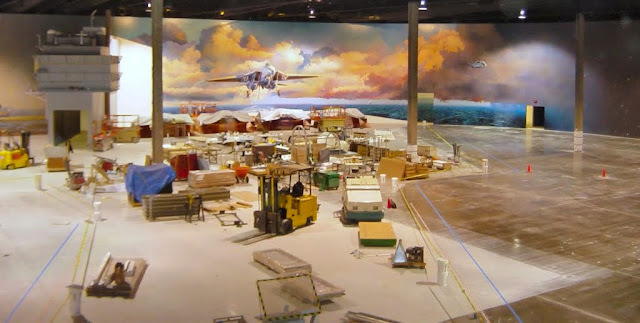 Here's a similar vantage point in the finished space with an actual Tomcat parked on the faux carrier deck. Then: F-18 at East Campus, September 25, 2003 taken while sitting in the cockpit of an F-14 Tomcat. Quite the change of venue! The goal with Main Campus was to include some aviation themed carnival style rides. We (the volunteers) were initially dubious about these, but people seem to like them well enough. The museum also commissioned novel artwork for the floor. 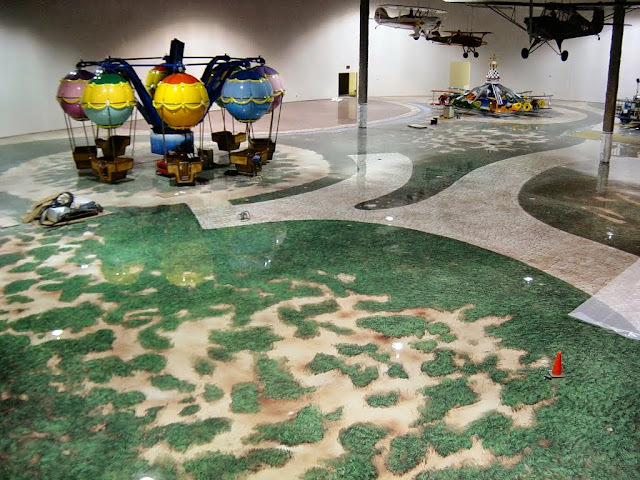 For the early era of aviation, the floor depicted a park-like setting. 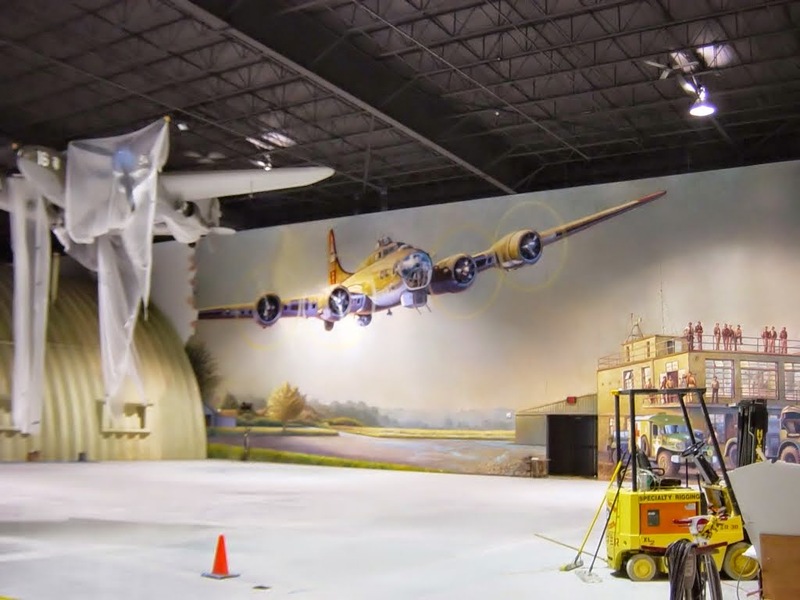 The walls were still a blank slate for the "Century of Flight" mural. The Bear absolutely loves this ride. Fortunately, after observing museum visitors spin in this "people centrifuge", I at least knew enough to sit facing the direction of rotation. 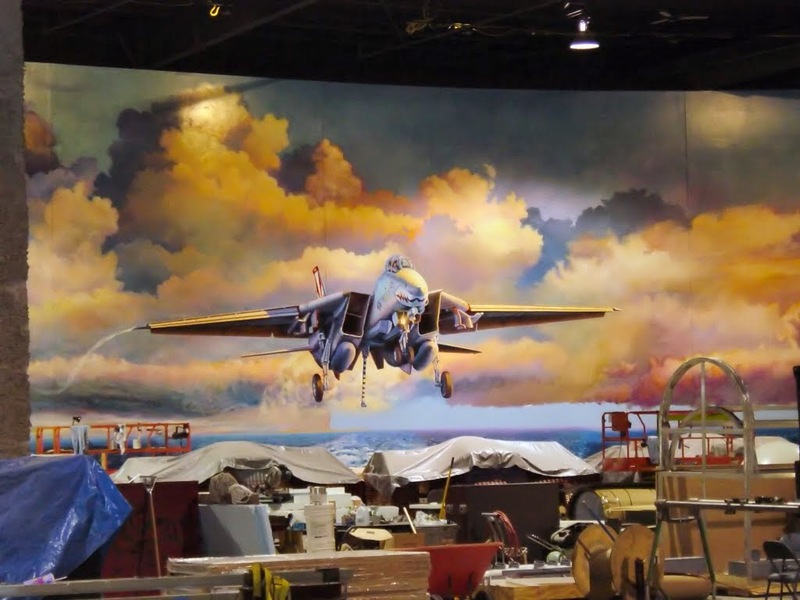 A portion of Rick Herter's completed mural is visible behind the balloon ride. The museum certainly changed a lot during my time there as a volunteer. 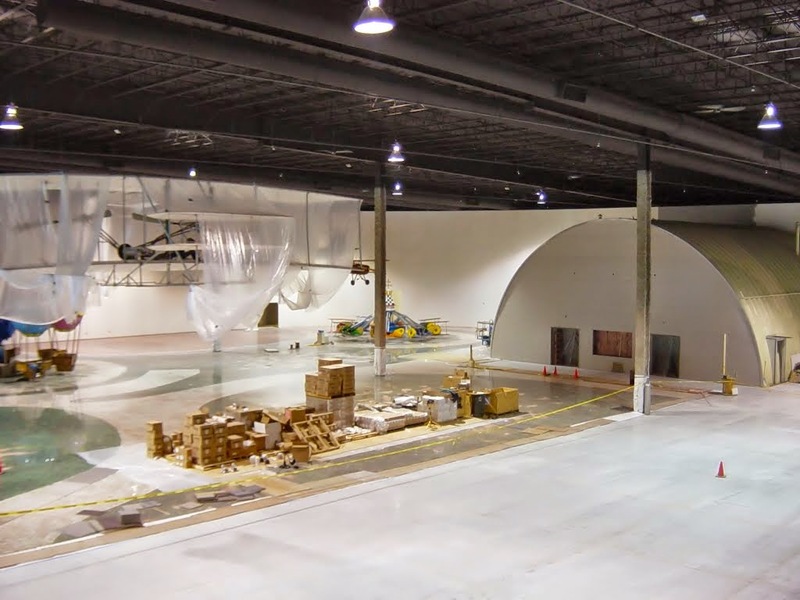 For me, the biggest changes began with a Flying Tiger ensconced in bubble wrap.